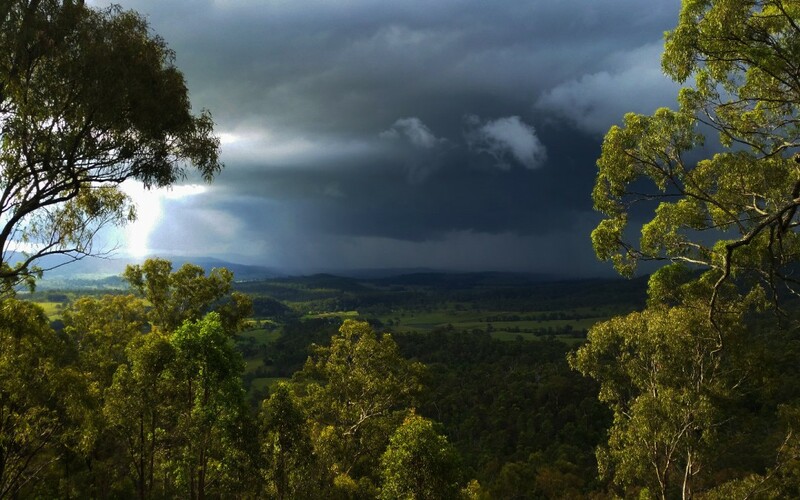 We had a little rain around the end of January, and beginning of February – 100+ mm in the last week of Jan, and 50+ mm in the first week of Feb. Some of this rain played havoc with some of our construction works. It was mostly due to volume and incomplete construction. 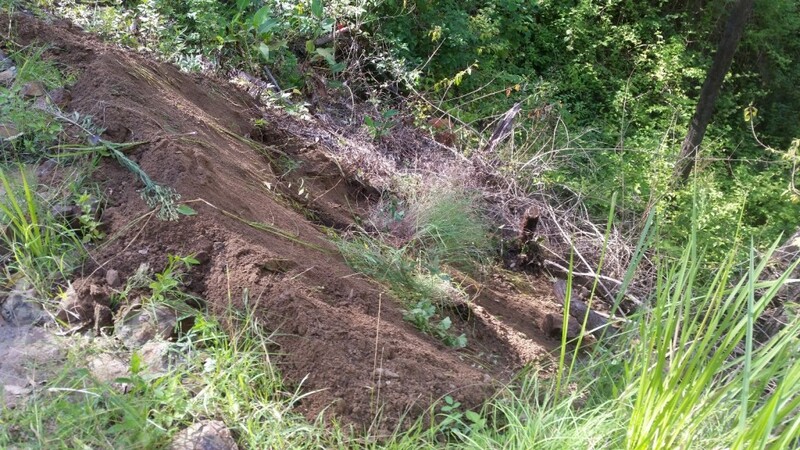 We had addressed most of the issues by now, and were therefore surprised to discover a big washout on the road side of the property. Storm water from the other side of Lamington National Park Rd, had crossed the road, as a small landslide had blocked it’s normal path to the drain under the road. So this meant that water flowed across the road, around the corner and followed the path of least resistance into the South Gully. As it flowed it took are large chunk of the hill with it, cutting a swathe near one of the Ironbarks just off the road. This area, is an area where we poisoned some Lantana in September/October, and we may have unwittingly contributed to the weakness of the hill, by killing the Lantana and not re-planting quickly enough. 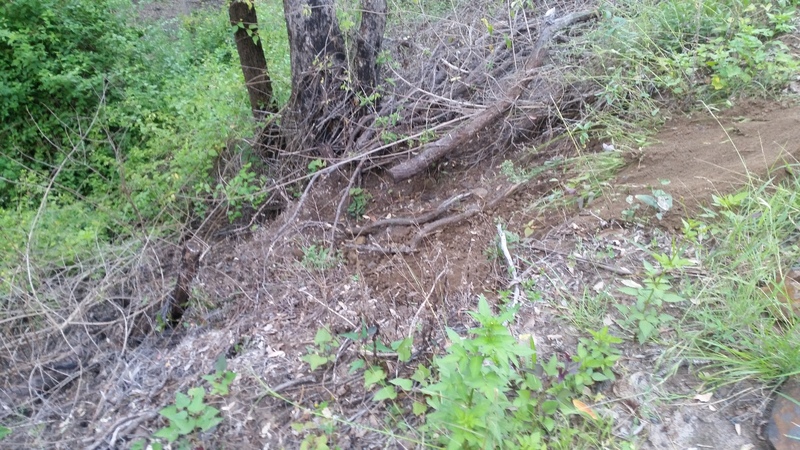 Erosion is an issue everywhere because of the volumes of water we have to deal with when rain falls in large amounts. 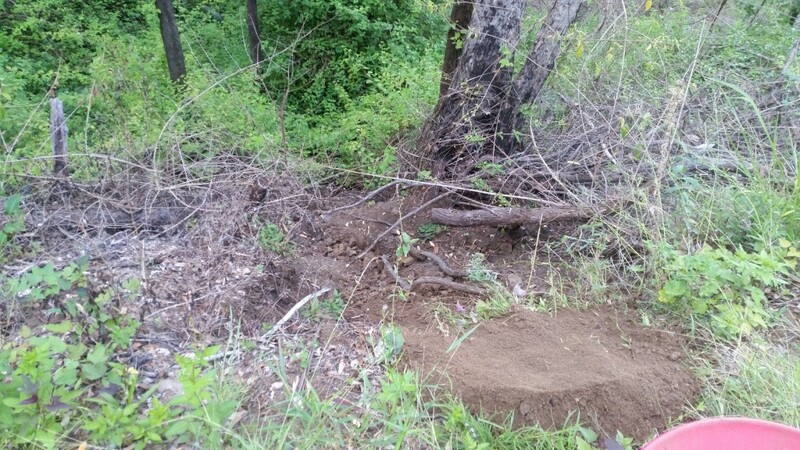 We now replant quickly and/or leave stumps and root systems of larger weeds in all the areas we poison and clear. 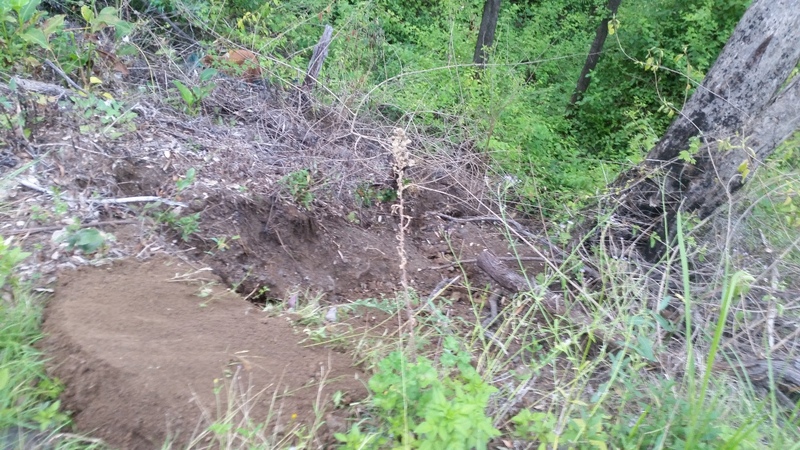 To address the problem, we took some of the soil from the landslide, and moved it across the road into the washout. 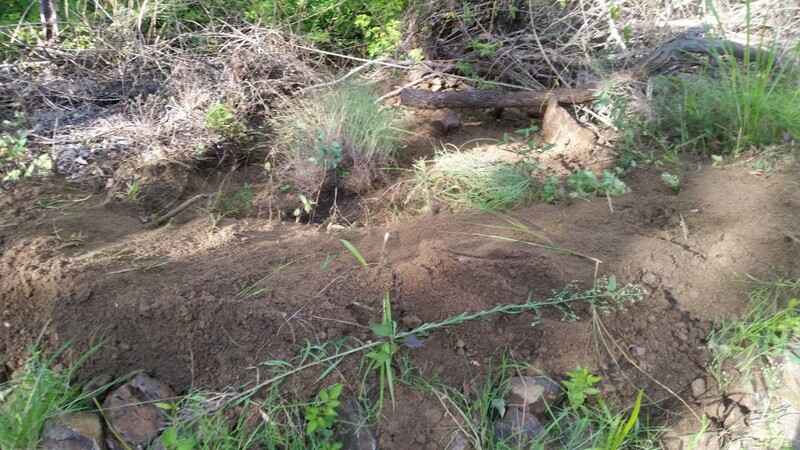 This was the soil that had fallen and was blocking the usual path of the storm water. So we were fixing the initial problem, as we fixed the consequences. 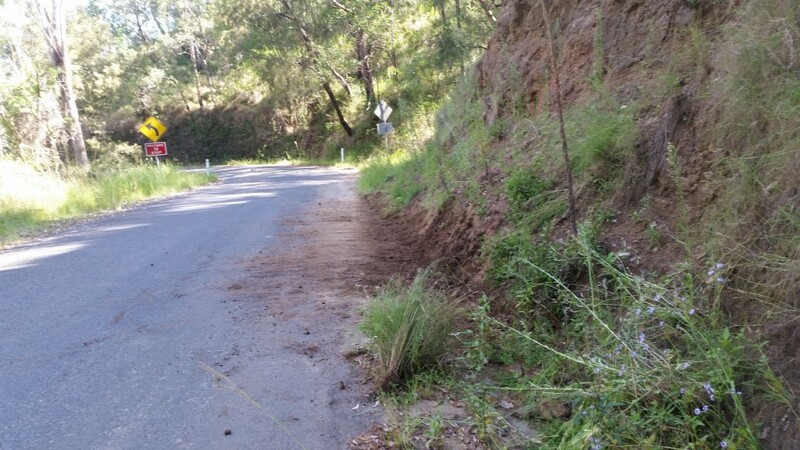 The soil we moved had fallen from up the mountain, and was encroaching on the road. So moving the soil was what the road crew would have done, if and when they came by. We filled the hole as much as possible, and plan on returning to move some more soil. We also have plans to plant in the area of the washout, so those plans got moved up the to do list and should be done by the end of the month. Put down a tool, drop a bucket, spill something, bump a rock, disturb some soil… it does not matter what it is… it will move downhill.